Colour has a very significant impact on the way your home looks and feels. After all, you want your home to be aesthetically appealing. It is important to realize that we respond to colour all the time; its significance increases even more when it comes to your home because that’s where you spend maximum time. The colour of your rooms is a reflection of your personality and the moods you tend to project. For example, soft, cool colours and neutrals exude tranquility because of their soothing effect. Similarly, warmer, contrasting and brighter colours create an atmosphere of hospitability. Hence, using these colours for your living and dining rooms will enhance the mood of the people living there. The happy colours. These vibrant hues definitely brighten your entire house and exude positive energy. These represent laughter and celebration. If your house feels dull, jazz up your walls with some yellow and see the difference. The color of peace. It purifies your thinking and helps you become more efficient. This colour will help you deal with clutter and manage your living space. If your house seems super cluttered, you know what to do. Green brings energy. This colour is literally the colour of life. If you want to feel rejuvenated and energetic, this colour should be part of your décor. Red for Passion. Do you want your house to exude energy and vibrancy? Red will add the right touch. A note of caution however: too much red can make children hyperactive and irritable so be careful about how you use this colour. Using this color in moderation is our suggestion. It is also important to use these colours in combinations rather than letting one color dominate your home color palette, because a single color selection might overwhelm your mood. You can also create bold or subtle variations within one colour palette with contrasting paint finishes. If you want a room to exude more liveliness, choose shades such as orange, yellow and gold. Shades of purple also add a touch of grandeur to your home. You can also make your living room more elegant by using neutral colours such as almond with wooden furniture; it adds a touch of class to your home. 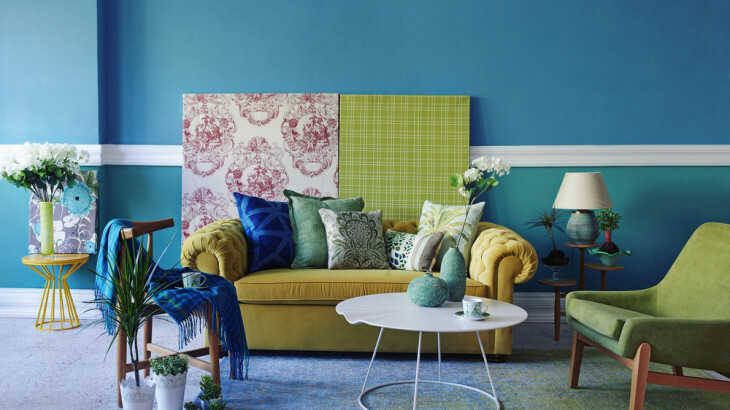 Most importantly, don’t let the colour of your home be a secondary decision; it sets the mood and tone of your house, both of which have a direct impact on your well- being.